The Final Packlist, Or Is It…? Joe Benedict from Outdoor at QBP gives us his recommendations for bike touring and bikepacking trips. How much stuff do I need? How much you needs is up to the you, but modern products will allow you to take more creature comforts with you since gear is more compact, lightweight and durable than it has ever been. Bring an insulated 2-inch thick air pad that packs down smaller than a Nalgene bottle; couple the pad with an uber-lighweight down quilt, and you’ve got a small package that is as comfy as any home mattress and down comforter. With all the changes in modern tents, there is no need to go to a tarp or bivy to be lightweight. You can find multiple options for full tents that weigh less than 2.5 pounds. There are essentials of course—a knife, a compass, water treatment, etc.—and Q-Outdoor stays on top of product trends and technologies to make sure that we always have the lightest and most durable premium product in stock at your disposal. 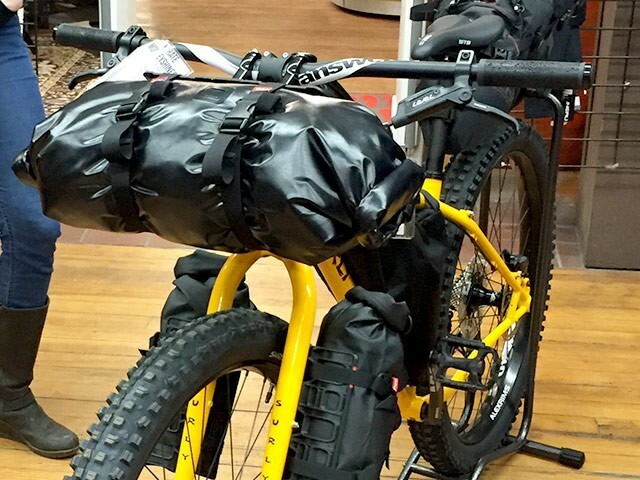 What about gear: frame bags or panniers? This is the leading question when it comes to bike camping. It depends on the type of trip and the amount of gear you have. If you are touring on pavement and want to maximize space, then panniers and racks are the way to go. 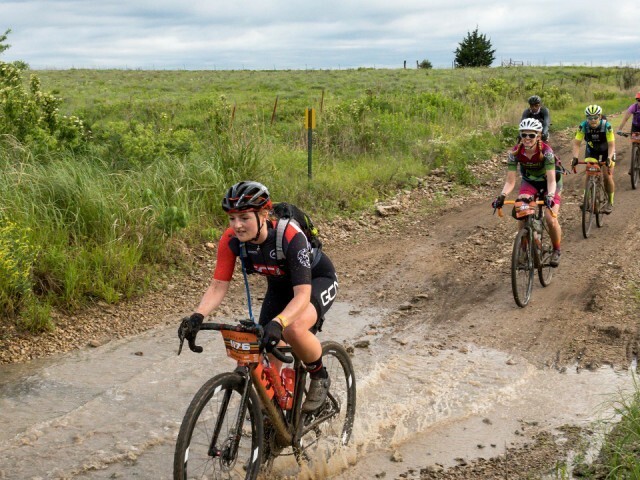 But we’ve all had that moment when we are about to push that first pedal stroke and the bike just doesn’t want to move. And a pannier setup makes for a wide center of gravity that’s unstable on anything but pavement. This is where frame bags come in. When off-road touring or bikepacking, having a low and small center of gravity becomes essential. Frame bags are no wider than the bike itself, so your center of gravity isn’t compromised at all. Removing the racks also removes a fair amount of weight. 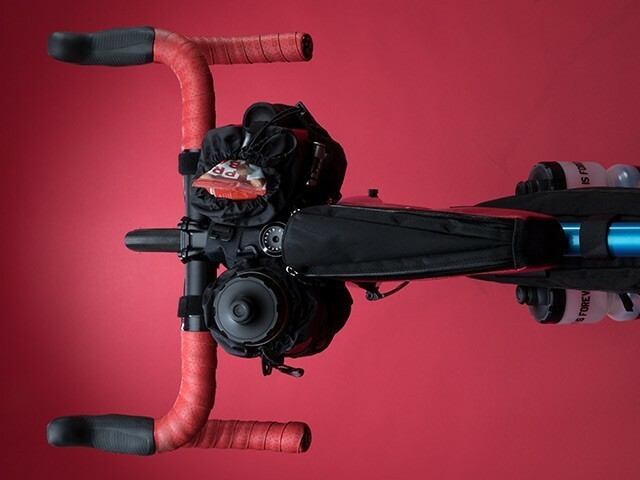 Frame bags cannot handle the heavier weight that panniers can, nor do they have the endless space, but as we said before, gear is getting better, lighter and smaller, and so the need to have so much storage space just doesn’t exist anymore. The same gear that once needed 100 liters of space now only needs 50, and that can be split between two or three frame bags and a small backpack. Let’s get to the basics of shelter. What are some considerations? There are options out there for any and all environments and users. For the longest time, if you wanted to be crazy lightweight, you either slept under the stars, John Muir style, accepting whatever Mother Nature chose to throw at you, or you brought a tarp or a bivy. With a tarp, you are protected from rain but not from bugs and critters. And a bivy, although great in dry conditions, can be claustrophobic—and there is no place to keep your gear dry. With lightweight tents, you’ve got multiple full-shelter options below 2.5 pounds in one-person models and sub 3 pounds in two-person models. Who can argue with 1.5 pounds per person for a full double-wall shelter that just keeps making this category better and better? While traditional tents are a great option with their weight savings, other sleep systems like hammocks are taking off as well. The benefit of getting off the ground is that the cold earth doesn’t sap your body heat, and you’re guaranteed to not have to deal with a rock or a stick under your tent. Although wind is a consideration, and an under- and top-quilt that fits around your hammock makes it an option 365 days a year. The long and short of it is that options abound and you can find the right sleeping combo no matter the environment or how difficult of a sleeper you think you may be. The Fly Creek shelters are three season, free standing, ultralight backpacking tents. Once you’ve set up camp, you’re going to be pretty hungry. What’s for dinner? Lightweight is the name of the game. Getting calories in at the end of the day is key, and dehydrated meals are the way to go. With a wide variety of meals available, everyone can find something they like. Dehydrated meals just require hot water poured right into the bag, so your cook systems end up lighter too. Modern alcohol stoves can be limiting at times since they don’t allow you to boil massive quantities of water, but if you want to maximize weight savings, there is no other way to go. They will save you time and give you a rolling boil fast so you can get your coffee and oatmeal—and most importantly yourself—up and at ‘em. Multifuel stoves are not to be forgotten, though. With their larger burners you can really get cookin’ in the backcountry and make anything from eggs and bacon in the morning to a pizza at night. In sub-zero temps there is nothing better, since white gas has no freezing point. The weight goes up but the meal options are endless. The 2.6 ounce MSR Micro Rocket does not sacrifice power for size; boils 1 liter of water in just 3.5 minutes. The included hard-shell case nests perfectly in MSR insulated mugs. Fork, spoon and knife set with matte finish handles and a polished eating surface. Soon to become your go-to cook set for solo adventures. The insulated mug keeps morning coffee hot and your hands cool, and nests in the lightweight 1.3 liter aluminum pot with enough room left over for your spork. It’s time for the evening’s jam sesh—air, acoustic, or electric? Definitely electric. Why play an air guitar and whistle a tune when you can bring your tunes with you? With small, portable speakers, and rechargeable backup batteries, you can rock out to hours of tunes from your phone and know you’ve got battery left to make a call if need be. And finally! Time to sleep. What do I need for a good night’s rest? Know your environment and be prepared for the coldest temps. If the range is 35 to 60 degrees, take a 30-degree bag. We’re talking only a few more ounces in weight, but being warm is the difference between having a great trip and a lousy one. It used to be that if you were worried about your sleeping bag getting wet, you would go with synthetic bags that would still stay warm. The downside to synthetic bags is that they don’t compress as well as down and are heavier. However, technology and inventiveness have brought us hydrophobic down—down that still retains its loft and warmth even when wet. If you’re going on a trip and you know it will be humid or that you’ll be exposed to sea spray, hydrophobic down is a great solution. When it comes to sleeping pads, comfort for a better night’s sleep is the goal, so you’ll be ready for more miles in the morning. Remember that the back of your sleeping bag doesn’t provide much insulation, since it’s compressed. The cold ground will sap your body heat, so an insulated pad can make all the difference. Many pads have differently shaped baffles (air channels)—some vertical and some horizontal. Take time to try them out and see what your back likes best. Light and compact, this three-season pad will keep you comfortable. The Insulated Air Core has a layer of Primaloft to keep you warm on those cold nights. I-beam construction and larger outer chambers keep you cradled in the center of the pad. Free from extraneous hardware, this lightweight bag lets you sleep like you would in a normal bed. Key features include an oversized comforter to seal out drafts, a sleeping pad sleeve to keep you on your pad, and insulated hand pockets that allow you to easily tuck in the sides. What are some other favorite items you can’t live without on a getaway? There are always two things I want to do once I get to the campsite: have some fun moving around and sit in comfort. 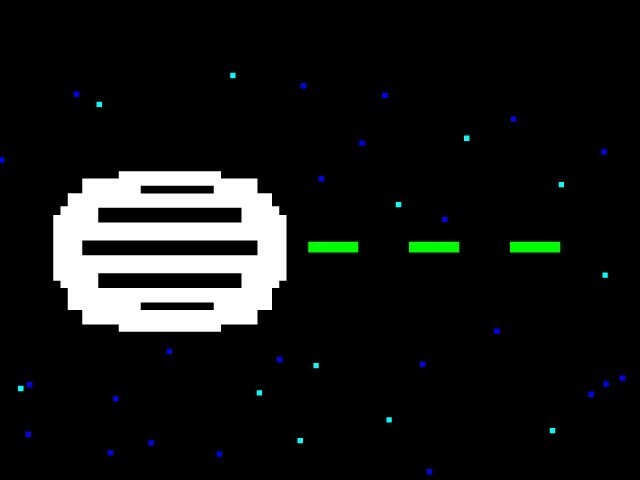 Bring a glow-in-the-dark Frisbee because when it’s getting pitch black out there is nothing like throwing a disc under the stars and watching it glide through the air like a meteor. And small, compact folding chairs are great. They let your back rest and get your bum off the ground. They can pack as small as a Chipotle burrito and they’re well worth it for tired legs. Outdoor at QBP guides retailers at the intersection of the Bike and Outdoor categories. 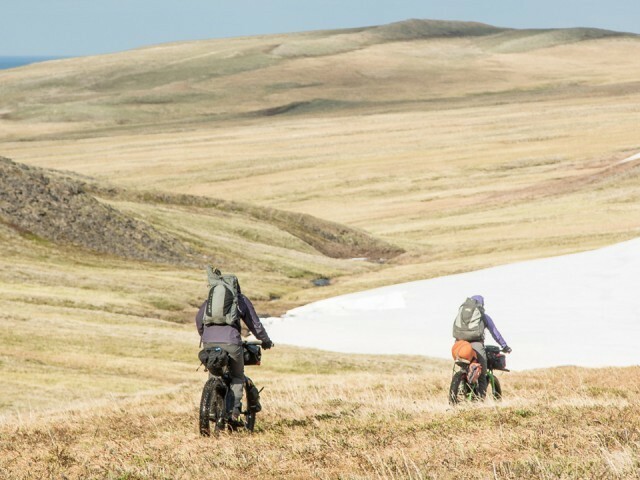 We consider bike camping to encompass traditional pavement touring, as well as the new growth categories of off-road, ultralight bikepacking and fat biking. Outdoor at QBP supports shops with bike camping clinics for retail staff, in-store signage, seasonal gear guides and customized product assortments. Dealers can choose gear that supports their brand story and reflects their customer base, with leading bike camping accessory brands like NEMO Equipment, MSR, Black Diamond, Esbit, CRKT, Optimus, Sierra Designs, Outdoor Research, Jetboil, Vargo, Big Agnes, MoraKniv, Suunto, Granite Gear, Light My Fire, Backpacker’s Pantry, Katadyn, and many others.